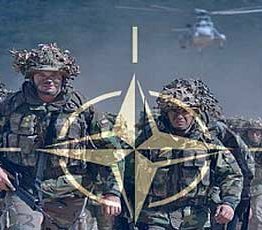 On Friday, February 26, just a day before the limited ceasefire in Syria was to take effect, the Atlantic Council, the preeminent NATO think tank, issued a report on the state of readiness of the NATO alliance to fight and win a war with Russia. The focus of the report is on the Baltic states. The report, entitled “Alliance at Risk” has the sub-heading “Strengthening European Defence in an Age of Turbulence and Competition.” Layers of distortions, half-truths, lies and fantasies of course obscure the fact that it is the NATO countries that have caused the turbulence from the Middle East to Ukraine. NATO is responsible for nothing in this report, except “protecting the peace.” Russia is the supreme aggressor state, intent on undermining the security of Europe, even intent on attacking Europe, an “existential threat” that NATO must prepare to repel. An interesting image that appears just below the title page is the logo of the Airbus Group, in letters as large as the title and a statement that the publication is a product of the Brent Scowcroft Center on International Security, in partnership with Airbus. There you have it, the logo of big business, intertwined with the US military machine; portraying one of the principle characteristics of fascism in the west, the interdependence and shared power of the western corporate and military complex. The Scowcroft Center is named after American Army general Brent Scowcroft, who, among other things, was national security advisor to Presidents Ford and Bush, lately advisor to President Obama and a long associate of Henry Kissinger. General Scowcroft is interesting for another reason for on September 11, 2001 Scowcroft was on board a US Air Force E-4B aircraft, known as the National Airborne Operations Command Center. The E-4B is a militarized version of a Boeing 747. Its purpose is to provide the American president, vice president, and Joint Chiefs of Staff with an airborne command center that could be used to execute war plans and coordinate government operations during a national emergency. The plane was sitting on the tarmac at Andrews Air Force Base, just outside Washington, D.C. waiting to take off for Offutt airbase in Nebraska, the headquarters of the Strategic Air Command when the first plane hit the World Trade Center in New York. Supposedly the E-4B was to take part in a previously scheduled military exercise called Global Guardian involving a mock nuclear war, but just a few minutes after take-off the Pentagon was hit by some type of airborne craft and the E-4B immediately withdrew from the purported scheduled exercise and became the actual American government command and control center. It then continued to Offutt Air Base in Nebraska where it delivered Scowcroft and his staff to the National Command Center, their original destination, where he was joined later that day by President Bush and his staff. Scowcroft was then head of the Foreign Intelligence Advisory Board and an adviser to and friend of President Bush. He was not a member of the armed forces, having been retired. He was a civilian. It was Scowcroft who later advised against the USA attacking Iraq alone and who called for the building of a “coalition” to invade instead to give the US cover, which is what finally transpired. Neither his presence on board the E-4B that day nor why it was prepared to be put into action just prior to the attack on the World Trade Center for an alleged military exercise involving a possible nuclear war, has never been adequately explained. I digress, but I am sure you cannot blame me, since it is my argument that the NATO alliance will stage a series of actions in the Baltic states using hybrid warfare methods, or will simply manufacture images that will be used to create a new myth to justify war, the myth that Russia is trying to seize the Baltic region. The report is designed essentially to provide the European governments concerned, that is, Britain, France, Germany, Italy, Poland and Norway, with propaganda they can feed to the people through the media channels, most of which they control, to justify increased military spending and increased military forces in order to face a “threat” from Russia. The Russian invasion of Crimea, its support for separatists, and its invasion of eastern Ukraine have effectively ripped up the post-Cold War settlement of Europe. President Vladimir Putin has shattered any thoughts of a strategic partnership with NATO; instead, Russia is now a de facto strategic adversary. Even more dangerously, the threat is potentially existential, because Putin has constructed an international dynamic that could put Russia on a collision course with NATO. At the center of this collision would be the significant Russian-speaking populations in the Baltic states, whose interests are used by the Kremlin to justify Russia’s aggressive actions in the region. Under Article 5 of NATO’s Washington Treaty, any military move by Putin on the Baltic states would trigger war, potentially on a nuclear scale, because the Russians integrate nuclear weapons into every aspect of their military thinking. Throughout the report the imagined enemy is Russia. Each segment written by an expert in military analysis from each of the countries concerned in the report contains the standard propaganda about Russia and that Europe is vulnerable and about to fall to the Russian hordes. The level of intelligence they expect the public to have must be very low if they really think such a fantastic document could be taken seriously as a description of reality or that their intentions could be understood as anything less than criminal. Any intelligent person handed such a document would automatically throw it in the garbage for the trash it is but then he would immediately retrieve it to take a second look, because they are telling us what they are going to do, what they preparing for. 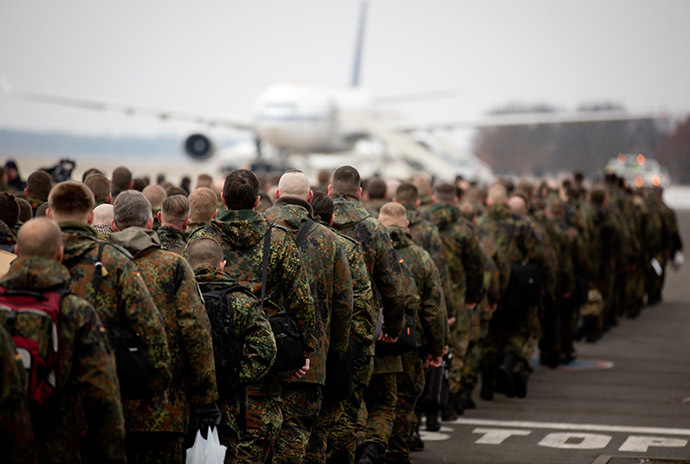 I wrote in my last essay that the increased build-up of NATO forces, in eastern Europe especially, has some similarity to the Nazi build-up for the invasion of Russia in 1941 Operation Barbarossa, is in fact a Barbarossa 2. This new report adds support to the expectation of dangerous actions in the Baltic states that will be blamed on Russia. It is probably not a coincidence that the report was released just as the Syrian cease-fire was to come into effect. The United States, clearly outwitted, out played and out fought, by the Syrians, Russians, Iranians and their allies in Syria has been forced to accede to a Russian proposed ceasefire for now. But already the Americans have talked about their Plan B, the carving up of Syria, their intention all along. We can expect them to do all they can to undermine it, engaging in a fight and talk strategy, keeping Russia occupied; in Syria, in constant tension in the Donbass, harassing their allies China and Iran, and now we can expect a new front to be opened in the Baltic states. What gambit NATO will use to create that front and a direct confrontation with Russia, who can say, but there will be one – the Baltic Gambit. Of course, it goes almost without saying but I shall say it once again, that this is all illegal under international law, under the United Nations Charter that prescribes the only acceptable means of settling international disputes. Under the Rome Statute this document could be used in evidence against the people that wrote it and applaud it in a trial on the charge of conspiracy to commit war crimes. But I doubt the prosecutor of the International Criminal Court will ask for a copy to read to draft an indictment. The prosecutor of the Court will do absolutely nothing as all this goes on right in front of her eyes and involving countries over which she has jurisdiction. The final disturbing aspect of the document is that it calls for nuclear “modernization” meaning rearmament and increased building of nuclear weapons and delivery systems, a call for more nuclear arms from the same countries which for months have been attacking North Korea for having the same weapons. You have to give it to them; they’ve got a lot of nerve. Trouble is, they’ve go too much and it really seems that they’re insane. So what can Russia do? Well, they called the American bluff in Syria, so why not do it again. This world cannot have peace unless peace is the only way that things can be done. The only way that can happen is to eliminate nuclear weapons so that no nation can threaten the existence of any other. The French section of the report happily reports that the nuclear disarmament groups in France no longer even bother to mention the matter much anymore so little resistance can be expected from that quarter. That applies around the world. But if Russia were to throw down the glove and call for mutual disarmament, a rejection by the Americans would at least underline the importance to mankind of nuclear disarmament and would make clear to the world who is the aggressor state. Otherwise it’s the Balkan Gambit and all that will follow.